That's pretty nice. I like how you were able to keep the color pallet of the background in the same tone as the character. 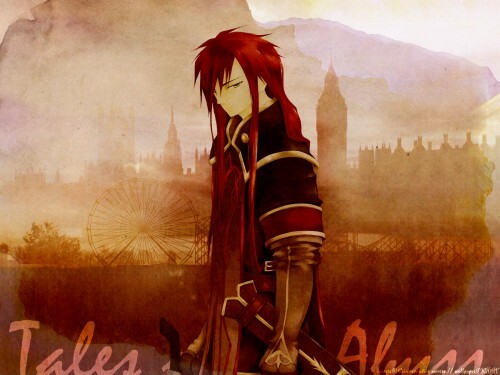 (That's Asch, btw.) And most of the elements would fit right in with the game's setting. The Ferris wheel is the only thing a little out of place. (Sort of, some may disagree with me, but I don't remember seeing anything resembling one in the game. But now I'm being knit-picky.) I would like to suggest making the text a little less intrusive. It stands out a bit too much for me, maybe a little less intensive red would be the fix. I do like the textures you used. It makes everything cohesive and fit together well. Except for the hair which give away a sense that they were cut with a scissor on the upper part the rest scan blends extremely well with the background. I like your choice to make the background abstract and with less detail because it really brings to the front the character. Nice colors and great concept well executed that of the old photo.